Only two years after the Dickinson County Conservation Board was established, it took on the care of a beautiful recreation area on the south side of Big Spirit Lake. The conservation board worked on an agreement with the State Conservation Commission for 25 years of management of Orleans Beach. The area east of the spillway between Big Spirit Lake and East Lake Okoboji had originally been and continues to be utilized as a swimming beach and boat launching site with parking for vehicles and boat trailers. The agreement was finalized in July 1970 and a master plan was developed, saying “A 1.8-acre tract of land along the shores of 5,864-acre Big Spirit Lake, Orleans Beach has the potential to become a meaningful segment of Dickinson County Conservation Board’s park system. “The western half has been developed as a private recreation area, with summer cabins and boat docks. The eastern portion has been used as a public access area with a swimming beach and boat ramp. In 1976, the park was renamed in honor of longtime Orleans resident and city clerk Peter McCormack Ainsworth. Also honored at the May ceremonies that year was the late Peter David Ainsworth, with the dedication of three benches in his memory. The first 25-year management agreement ended in 1995, but Dickinson County Conservation then entered a second 25-year agreement with the Iowa Department of Natural Resources, which now owns the property. The years have brought about a variety of improvements at Ainsworth-Orleans Beach, from paving the circle drive to the construction of a shelter house in 2014. The family of Bob and Delaine Olson, former resort owners in the Iowa Great Lakes area, donated the funds to build the shelter house at the park, and it was dedicated in honor of their legacy. Bob Olson was also a former councilman and mayor of Orleans. In addition to funding from the Olsons and the Dickinson County Conservation Board, donations for park improvements were received from the city of Orleans, Spirit Lake Protective Association and a memorial in the name of Harry Perkins. Today, residents and tourists flock to Ainsworth-Orleans Beach each summer, utilizing the sandy swimming beach, picnic area and playground on the gorgeous south shore of Big Spirit Lake. Even off-season days bring out people who want to enjoy the breeze coming in off the water or to watch the water flowing into the spillway. Sunrises, sunsets. Warm and chilly days. Calm waters and choppy waves. Ainsworth-Orleans Beach is a beautiful place to frolic or relax. 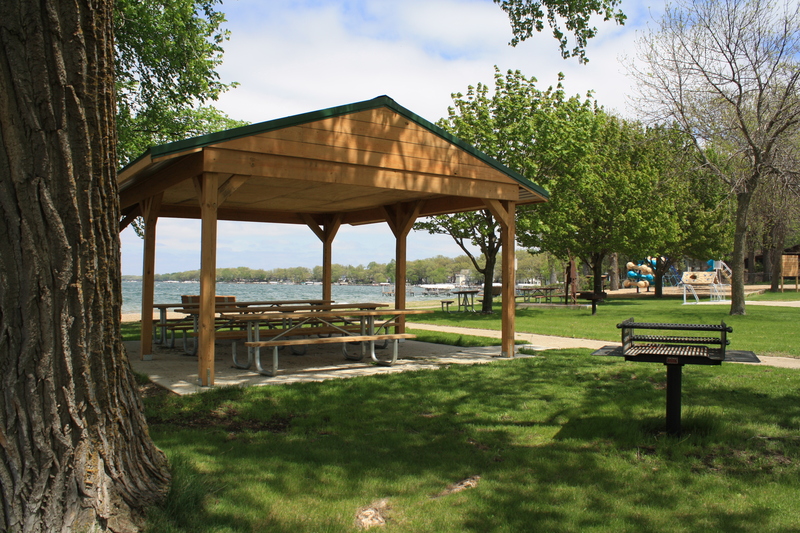 Ainsworth-Orleans Beach is located at 25040 140th St. in Spirit Lake and is open year-round. With eight parks and even more public areas, the Dickinson County Conservation Board has a variety of gems for the public to explore to help foster an appreciation of the natural world. Learn about each of these parks at http://dickinsoncountyconservationboard.com/our-parks/ and see a new series of Youtube videos on each park, coming out periodically in 2016. Check out the Ainsworth-Orleans video on the DCCBnaturecenter Youtube channel.